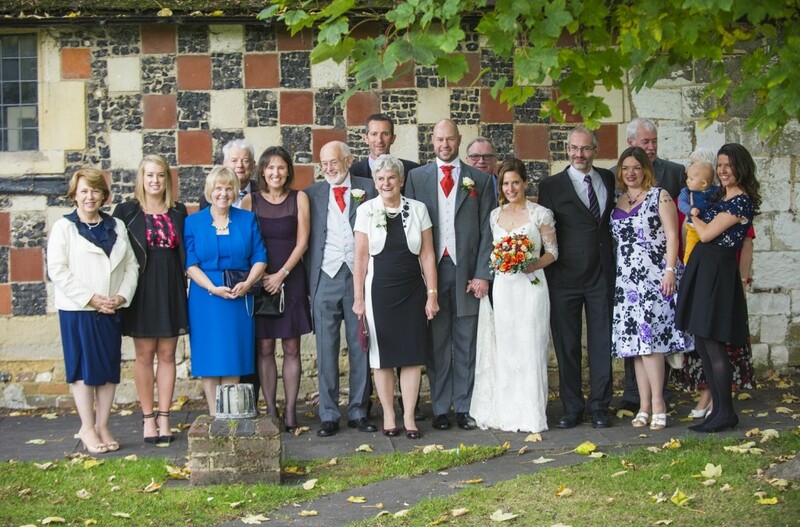 Moving into autumn, we’d like to share Ruth and Steve’s wedding with you. “Autumn is a second spring where every leaf is a flower”. This is so true as the foliage becomes gloriously coloured. It also supports berries and nuts which can stand alone in wedding decorations. 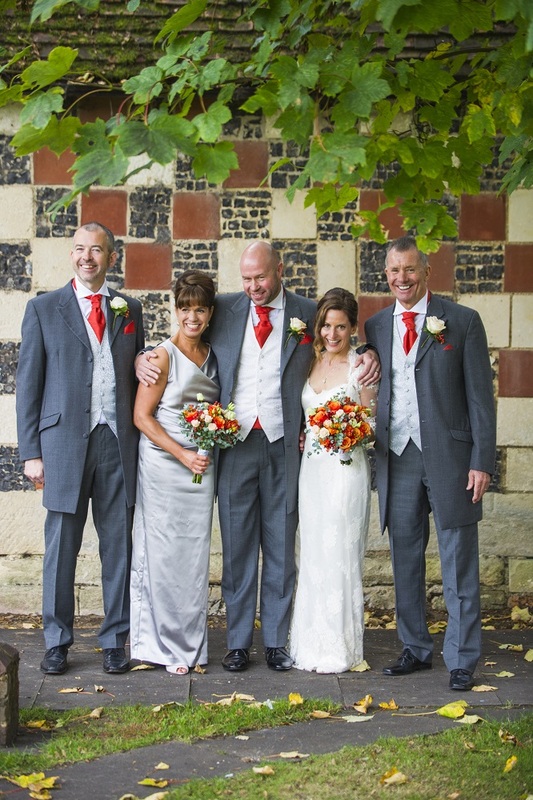 The colours we used for Ruth and Steve’s wedding typify the rich hues of the season. 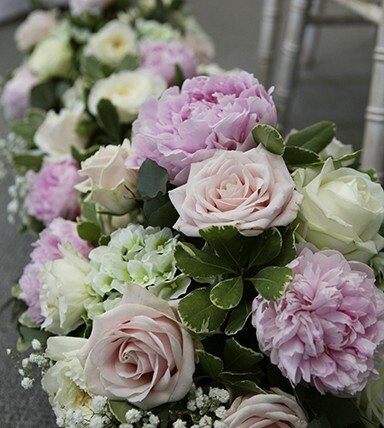 We love a brief which allows us to really explore shades and tones of similar colours. 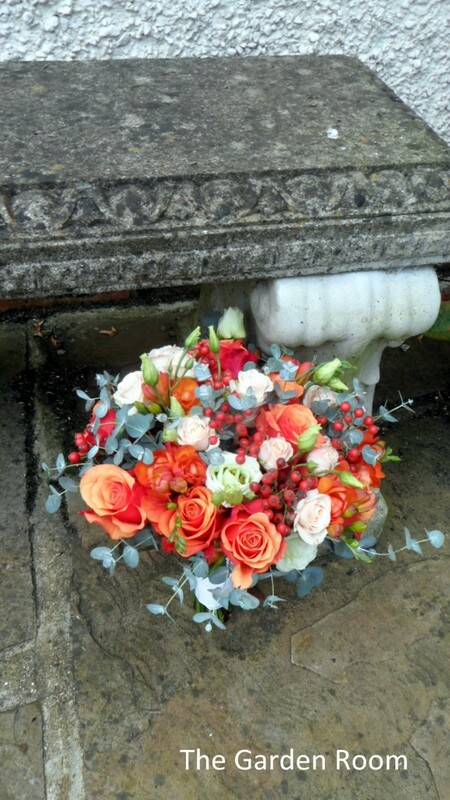 For the bride’s bouquet, we used rich burnt orange and champagne roses with green lissianthus and rose hips. 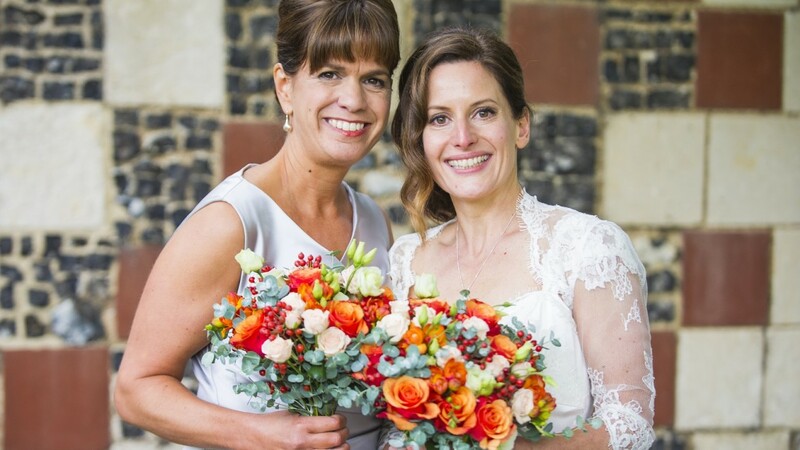 We absolutely love this autumnal colour mix! The Eucalyptus Gunni (such a pretty pale foliage) is great in bouquets and is finer than the Eucalyptus Cinerea that we sometimes use. 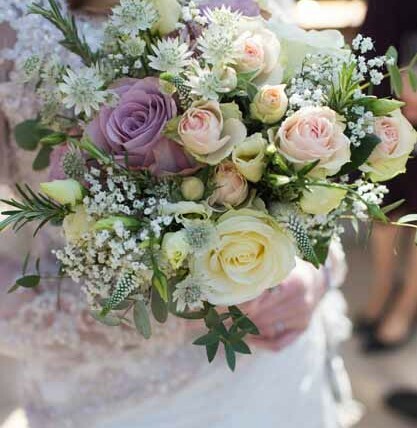 The maid of honour carried the same style of bouquet and flowers, and we added rose hipe to the buttonholes. 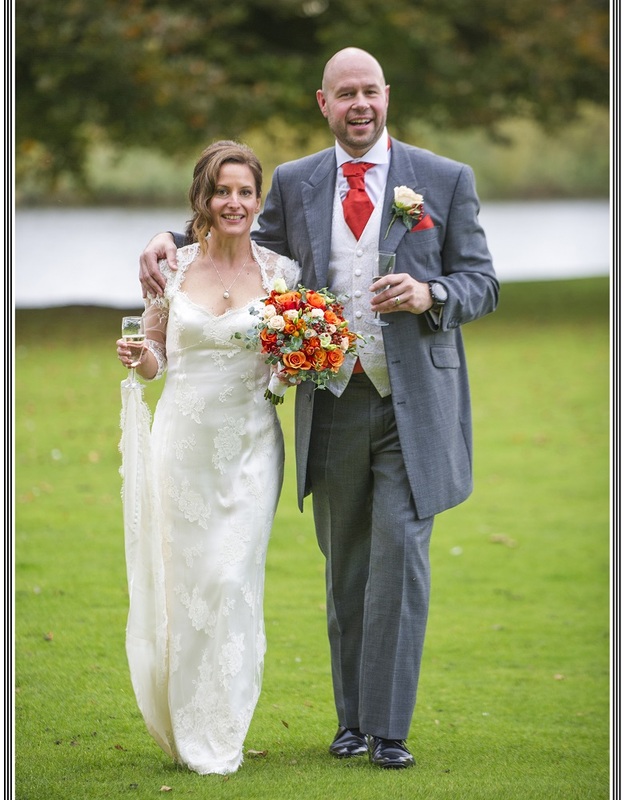 I first met Steve and Ruth at a Bisham Abbey wedding fair where they were thinking of booking the venue for their wedding. Steve has strong links with fitness and runs his own training classes in Farnham Common and Bisham Abbey is home to the National Sports Centre. The Abbey seemed to fit this couple and their interests perfectly. 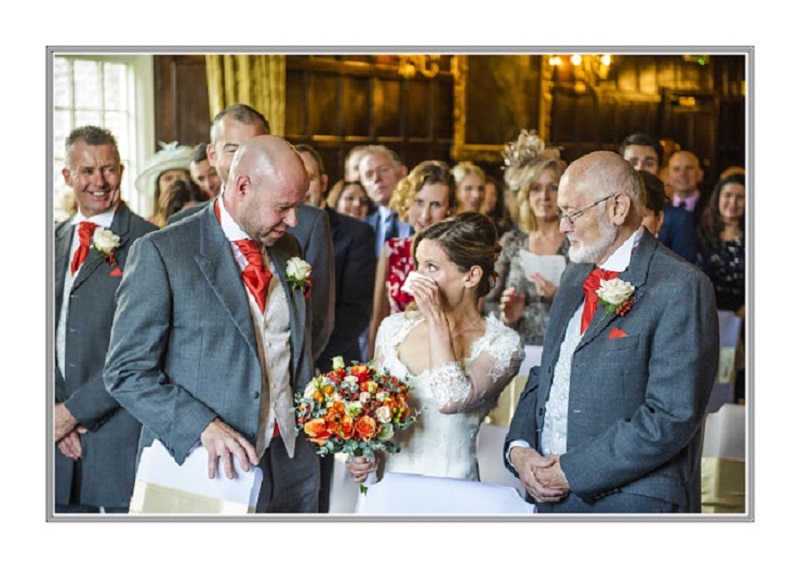 The Abbey itself is a stunning and majestic thirteenth century wedding venue, formerly the home of Henry the VIII. 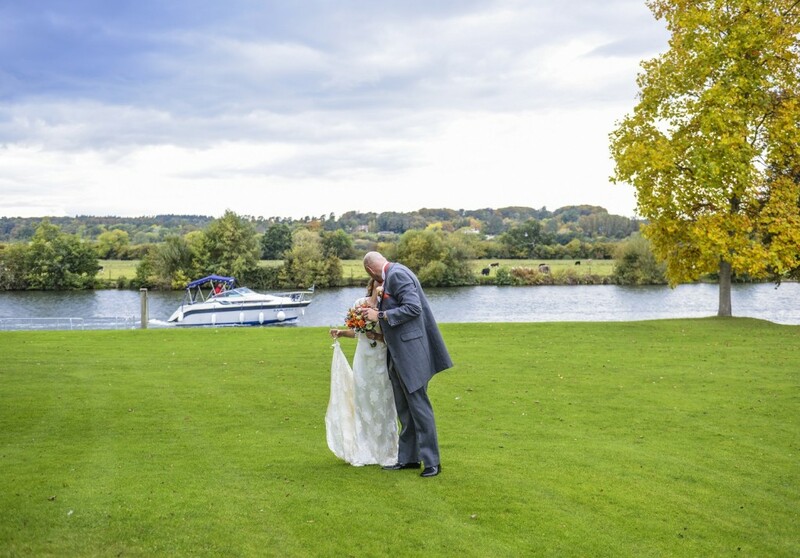 The backdrop to the Abbey is superb with the river Thames running close by. It is a perfect setting for after-ceremony drinks on the terrace. If you get married in the local church, you can even arrive by boat! 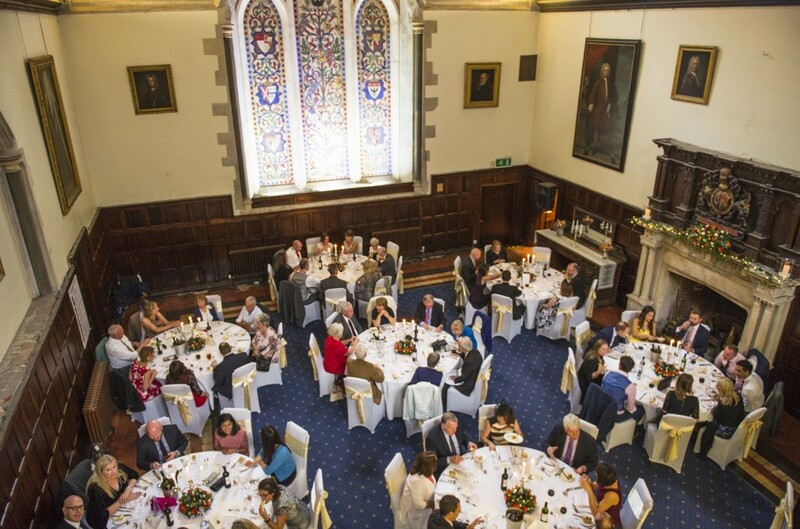 The Great Hall is an ideal space for a wedding breakfast as there is so much grandeur. There is beautiful wood panelling and historic pictures already present in the building which means decorating can be kept minimal. We usually focus on the mantelpieces both in the Great Hall and the Warwick room, which is often used for the ceremony. Here, we often place greenery. Sometimes we use large headed roses, fairy lights and storm vases with candles. 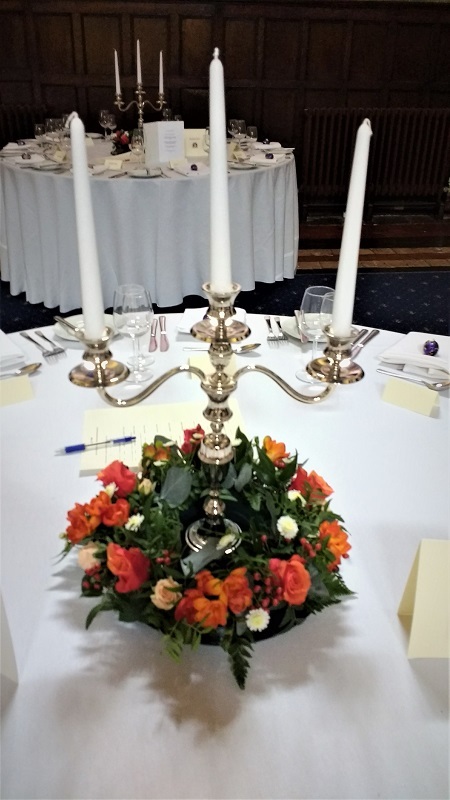 Any long and low arrangement on the registrar’s table can be used after the ceremony for the Top Table or Mantelpiece in the Great Hall. You can often apply this idea in other venues too. Drying eyes after a very touching ceremony, Steve got very much into his groove by entertaining the guests at the wedding breakfast. Both Steve and Ruth are very much party people. 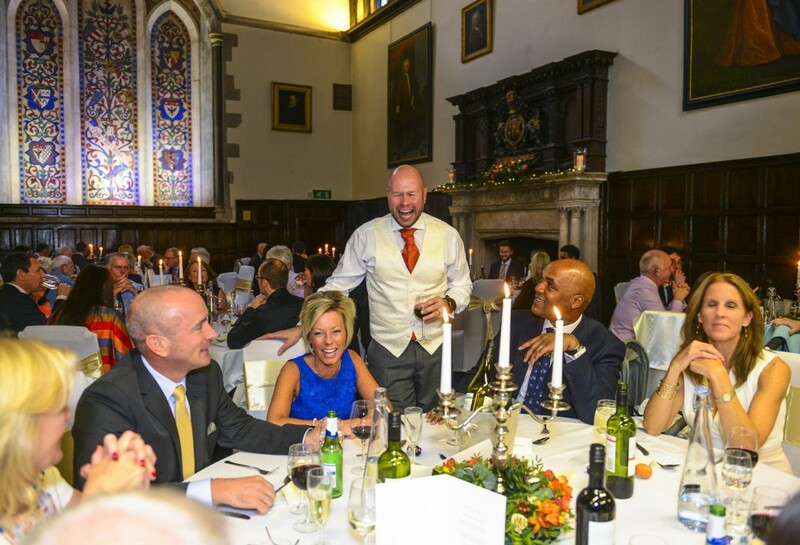 Luckily for them, Bisham Abbey has plenty of space for your band or disco, either in the Warwick Room or in the Margaret Dickenson Room. 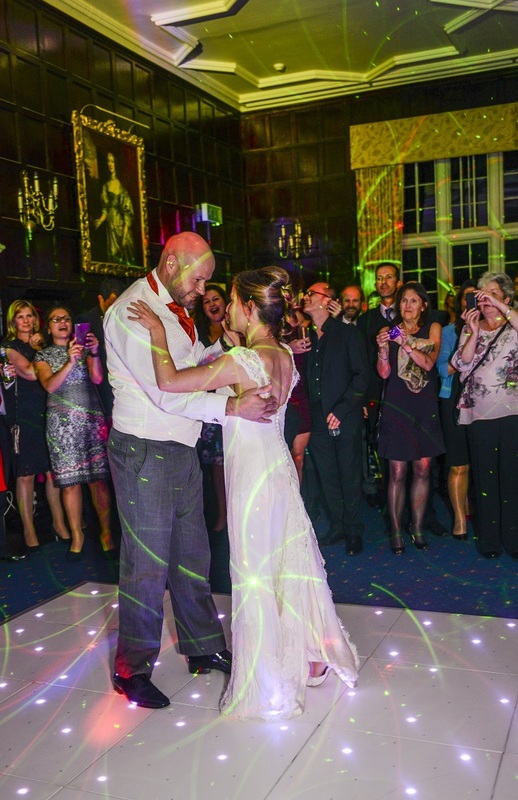 The first dance is always special – we can recommend Susanna of Dance The Night Away to help you create the most magical first dance! 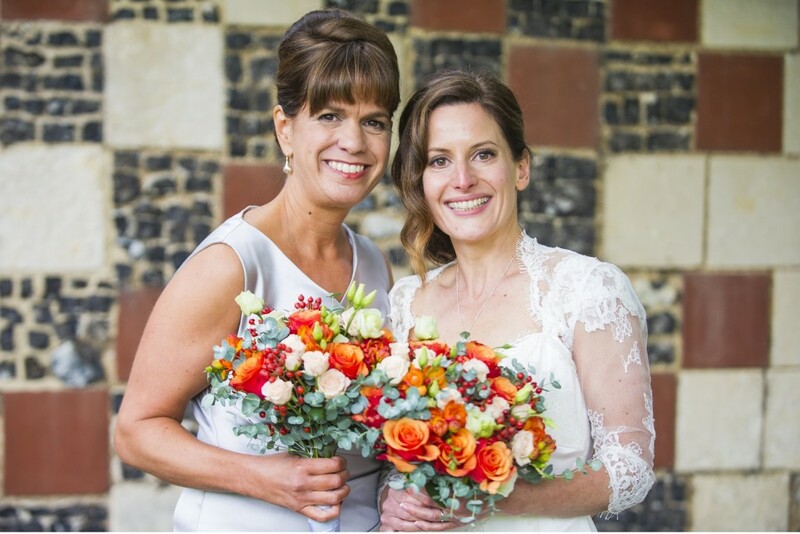 If you are planning on having an autumn wedding, now is the time to take a look at all the seasonal berries and foliage that are available and discuss your thoughts with your florist. “Thank you so much for the gorgeous flowers. 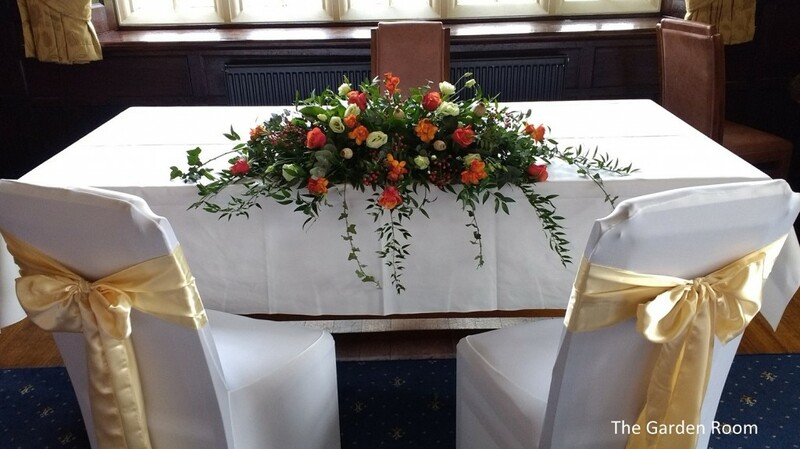 The colours and arrangements were beautiful and so many people commented on them.Thank you so much for guiding me (a complete flower novice) and producing such a lovely result!” – Ruth. 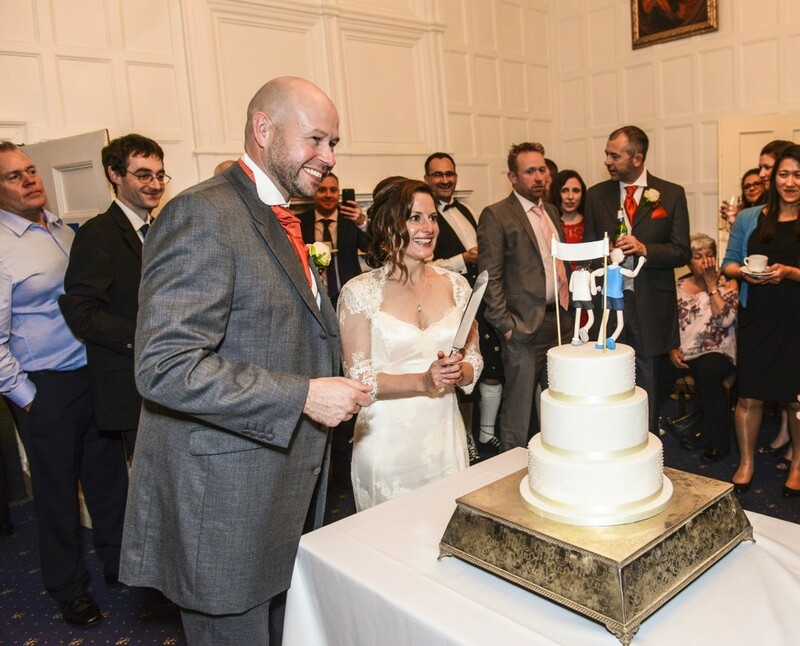 Happy second anniversary, Ruth and Steve! Here’s to many more wonderful years, best wishes from your Garden Room team. Credits for some of the images (the best ones!) used go to Jacqueline Ferguson of Penn Studios.